Steepest Eurozone Contraction Since 2009! The global recession which started in Europe, is strengthening led by further declines in the eurozone. Markit reports Eurozone sees steepest contraction since June 2009 despite downturn easing in Germany. 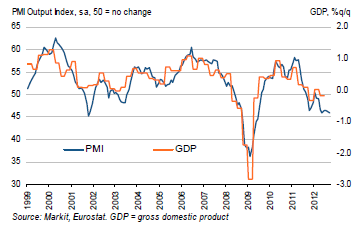 Flash Eurozone PMI Composite Output Index at 45.9 (46.3 in August). 39-month low. Flash Eurozone Services PMI Activity Index at 46.0 (47.2 in August). 38-month low. Flash Eurozone Manufacturing PMI at 46.0 45.1 in August). Six-month high. Flash Eurozone Manufacturing PMI Output Index at 45.5 (44.4 in August). Five-month high. Index fell from 46.3 in August to 45.9 in September, according to the preliminary ‘flash’ reading, based on around 85% of usual monthly replies. The index therefore signalled that the private sector economy contracted for the twelfth time in the past 13 months, with the rate of decline accelerating slightly to reach the fastest since June 2009. The September reading rounds of the weakest quarter since the second quarter of 2009, with the average PMI reading for the third quarter at 46.2, down from an average of 46.4 in the second quarter. Manufacturing and services saw similarly steep rates of decline in September. However, while manufacturing output fell at the slowest rate since April, the service sector saw the largest drop in activity since July 2009. The faster rate of decline in output reflected an accelerated rate of loss of new business – the largest monthly fall since May 2009. France saw output and new orders both fall at the fastest rates since April 2009, with rates of decline accelerating markedly in both manufacturing and services. Employment fell for the ninth consecutive month across the Eurozone, dropping at the fastest rate since January 2010. The rate of job losses in services was the highest since November 2009 and steeper than the cut seen in manufacturing, which was the lowest for five months. While only a marginal fall in employment was seen in Germany, French payroll numbers were cut at the fastest rate since November 2009, and elsewhere across the region employment showed the largest monthly fall since July 2009. Markit senior economist Chris Williamson was hoping moves by the ECB would spur confidence: “We had hoped that the news regarding the ECB’s intervention to alleviate the debt crisis would have lifted business confidence, but instead sentiment appears to have taken a turn for the worse, with businesses the most gloomy since early-2009 due to ongoing headwinds from slower global growth. The recent moves by the ECB and Fed were hardly confidence-inspiring. Rather, they were a sign of Panic! Things are deteriorating rapidly, more austerity is coming to Spain and Italy. France is hiking taxes and fees like mad, as well as considering plans to prohibit businesses from firing employees, and economists are expecting or hoping interest rate cuts will inspire confidence! Not only are such economists unable to think, they cannot even see what 20 years of monetary and fiscal stimulus did for Japanese “confidence”, which is to say nothing at all. However, lower interest rates and fiscal stimulus did leave Japan a confidence-eroding mountain of debt in its wake. Nonetheless, Bernanke and Draghi have vowed to keep doing what they are doing until it works, and economists are hoping it will. It’s pure insanity.